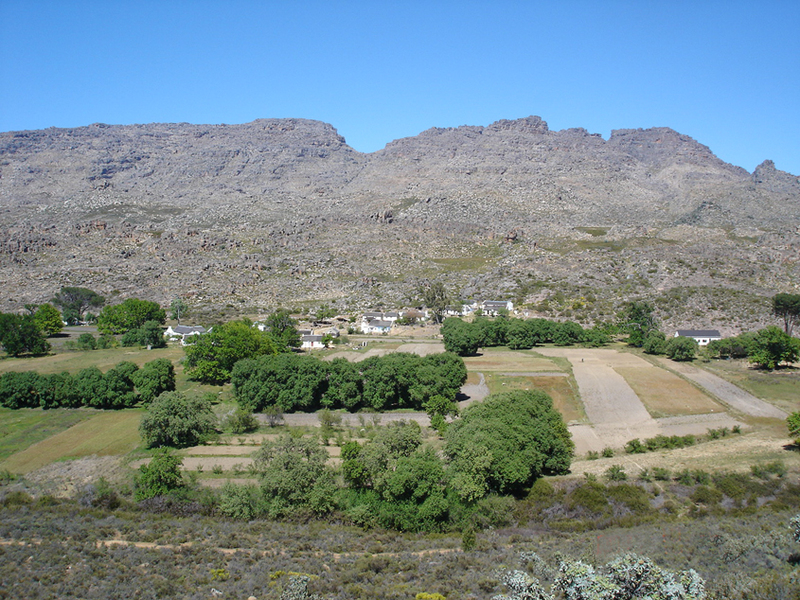 CEDERBERG MOUNTAINS – After a three hour drive from Cape Town Airport and a light lunch in Clanwilliam, the afternoon’s walk leads you among element-sculpted rose-red rocks to a charming hamlet, where the villagers will provide meals and a comfortable night in their thatched roof guest house. 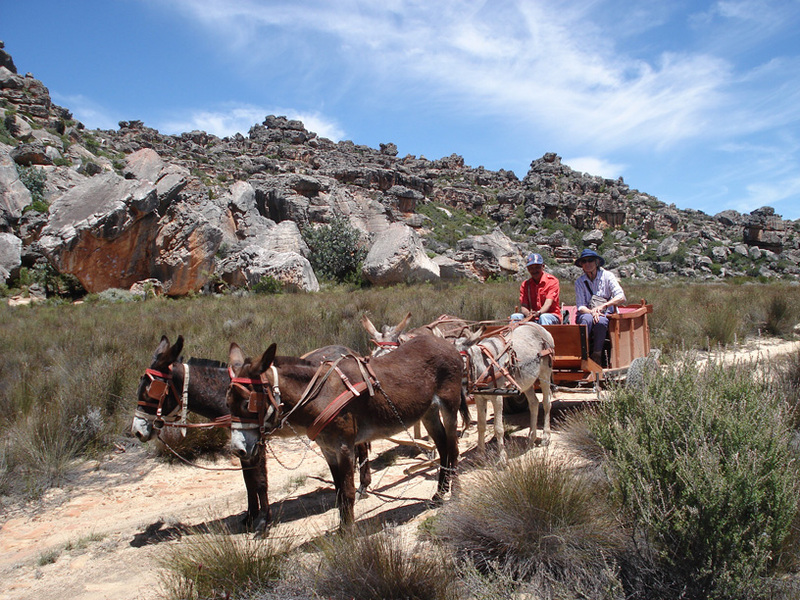 The next day’s hike is longer, but donkey carts are available for those preferring a lighter day; the night is spent in the smallest village – 4 houses! – in the area. On the the third day’s hike you pass waterfalls & mountain pools before reaching Kleinvlei, the remotest village of the Moravian community. 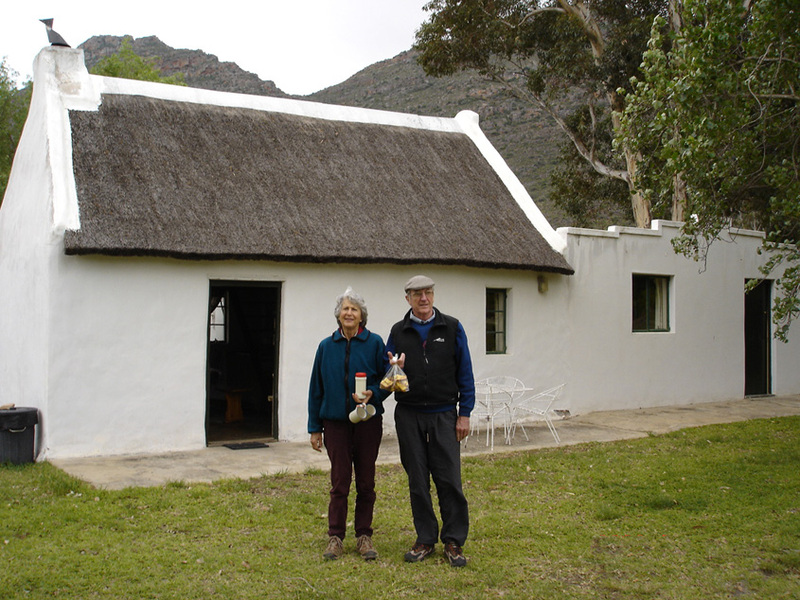 On the fourth morning a short hike through a spectacular gorge brings you to Wupperthal, a Mission village dating to 19th Century, and where your transport will be waiting to take you to the winelands of the Cape. ELGIN WINELANDS – Only a few hours drive from the Cederberg, you will discover the lovely tapestry of fynbos and fruit farms surrounding the “Green Mountain”, whose trails are gentle and interspersed with opportunities for wine-tastings. The cherry on the top? Three nights in a beautifully refurbished four star country house more than two centuries old, serving gourmet dinners & local wines. The historic homestead is set against the majestic mountains and is home to an extensive contemporary South African art collection. CAPE TOWN & CAPE of GOOD HOPE – From the comfort of a 4-star hotel in the iconic Waterfront (4 nights), you will enjoy two days of hiking and one day to visit some of the area’s famed sites: ascend Table Mountain (1 052m) by cableway, then hike towards the lush Constantia Valley; drive down the Cape Peninsula to Cape Point Nature Reserve and after admiring the penguin colony at Seaforth, hike along the False Bay coast to Cape Point; visit the District Six Museum and/or the Castle and/or Nelson Mandela’s Robben Island prison and end up by exploring the extensive (& expanding!) Waterfront for some last- minute shopping! 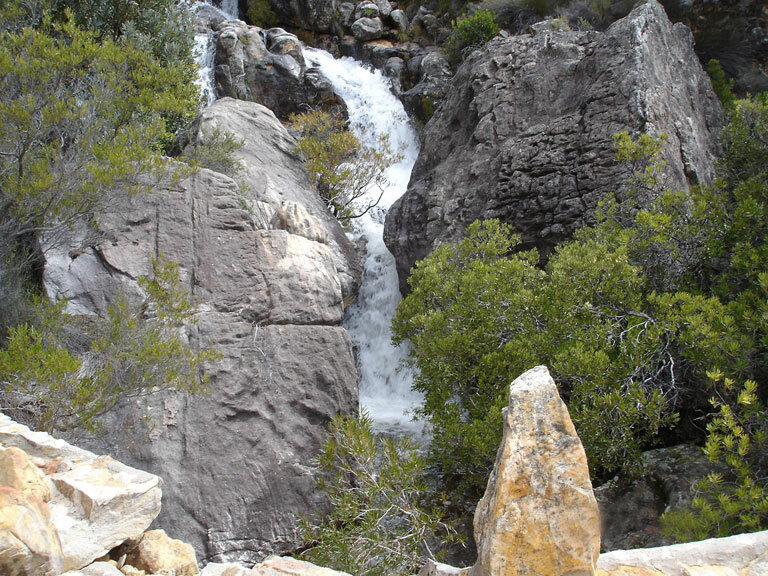 Booking details for the Triple Hiking Holiday are provided in the Hiking Trails section of this website. 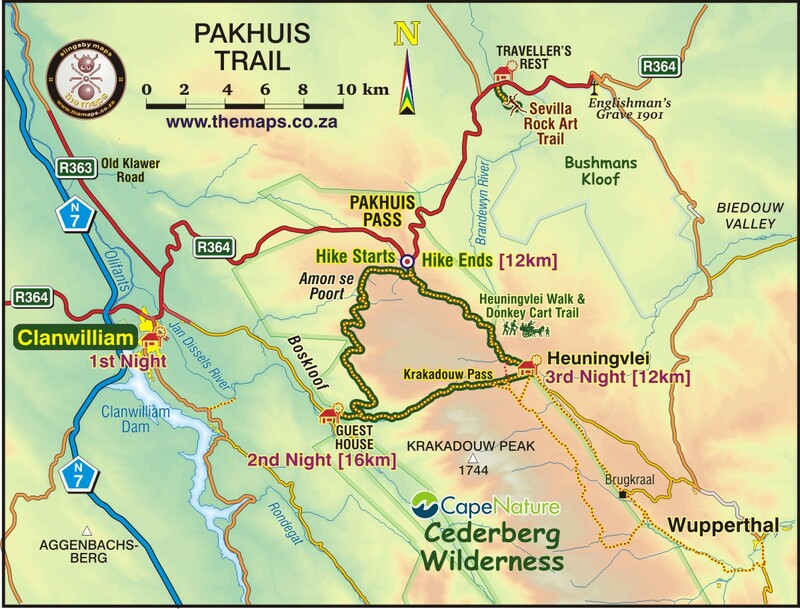 Eleven teams of 4 to 6 hikers per team will spend 7 days walking from Pakhuis Pass to Driehoek, with the first team starting on Thursday 21st August and the last on Sunday 31st Aug. The arrival of the 1st team will coincide with the opening of the famous Clanwilliam Wild Flower Show at 18h00 on 28th August at the “Historical Flower Church” in the Main Street of Clanwilliam, which will be closed for the length of the proceedings. This is a “slackpacking” hike, with accommodation, meals, guides to show you the route & baggage transfers provided by the Moravian villages in the Wupperthal area. 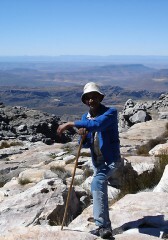 By taking part in this hike, you will not only experience the wonderful hospitality of the Cederberg folk, but also help them in a community tourism venture. 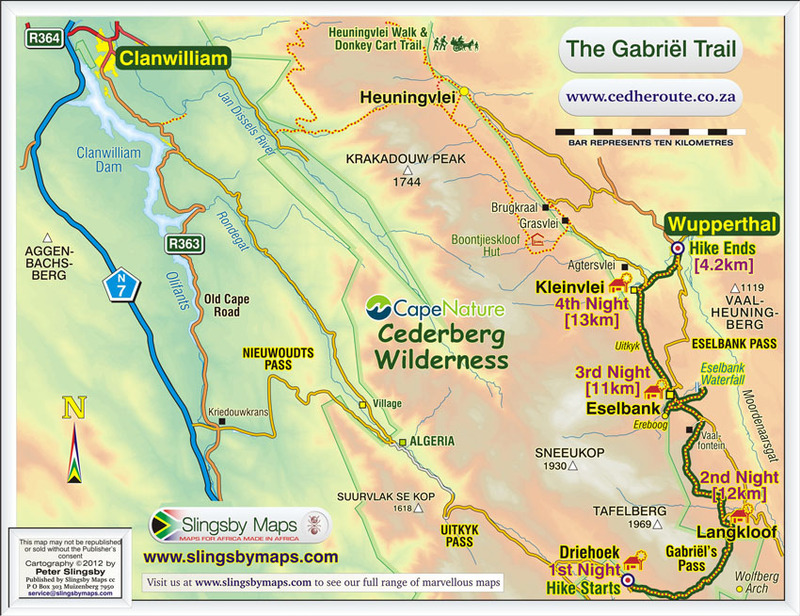 A new Cederberg hiking map from Slingsby Maps. 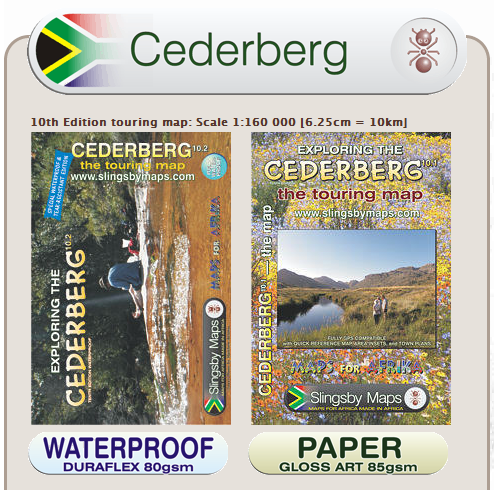 Earlier this year Slingsby Maps published a new hiking map for the Cederberg called “Hike the Cederberg”. It is to a scale of 1:40 000, is printed on two double sided sheets and is available online and from book stores and outdoor shops. 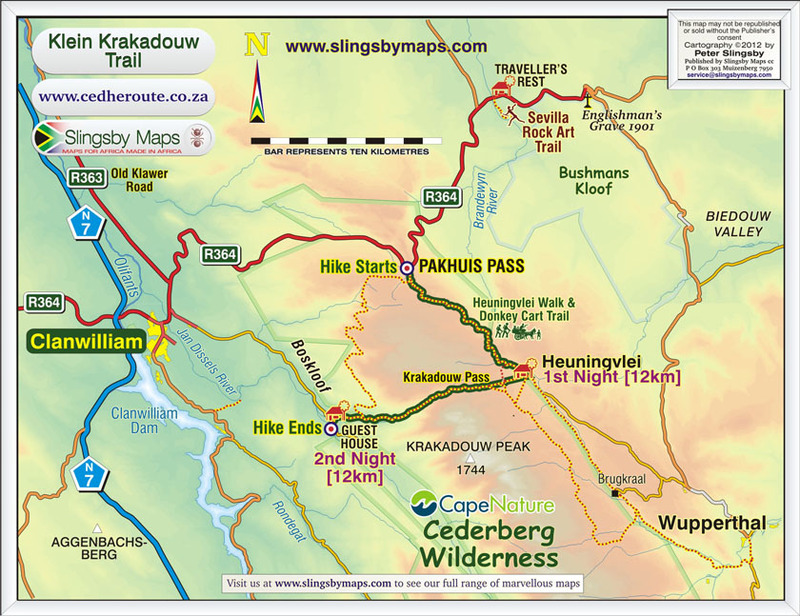 Posted in Uncategorized	| Comments Off on A new Cederberg hiking map from Slingsby Maps. All our trails are open again. 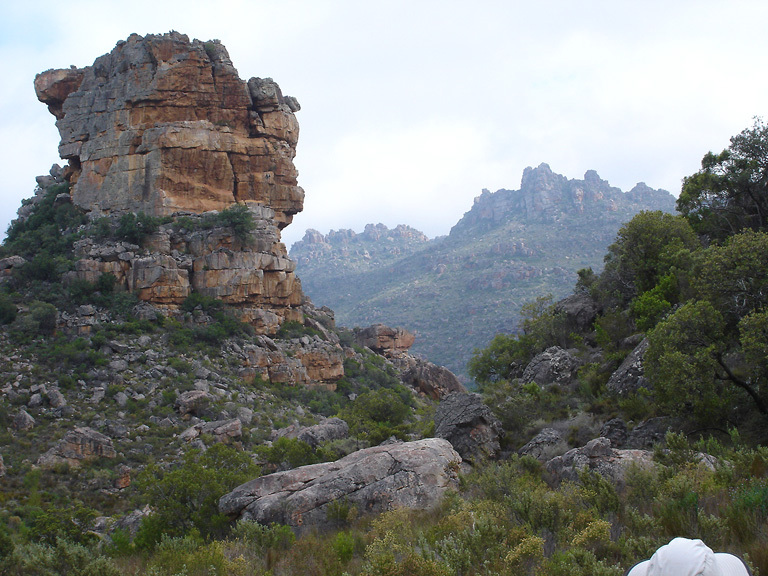 Please note that Cape Nature has now (from 3 September 2013) re-opened the paths in the northern section of the Cederberg Wilderness for our Cederberg Heritage Route Trails. The huge veld fire at the end of January 2013 caused extensive damage in this northern area and as a result the paths were closed for about seven months. Now that the paths are open again we can accept reservations for all six of our trails. Posted in Uncategorized	| Comments Off on All our trails are open again. Summer and winter discount of 10% on trail prices. Trail price discounts of 10% are now available for the summer months of January and February and for the winter months of June and July. Posted in Uncategorized	| Comments Off on Summer and winter discount of 10% on trail prices. 1. Our slackpacking trails continued to operate satisfactorily during the year. The new Gabriel Trail operated for the full year and has been well received. 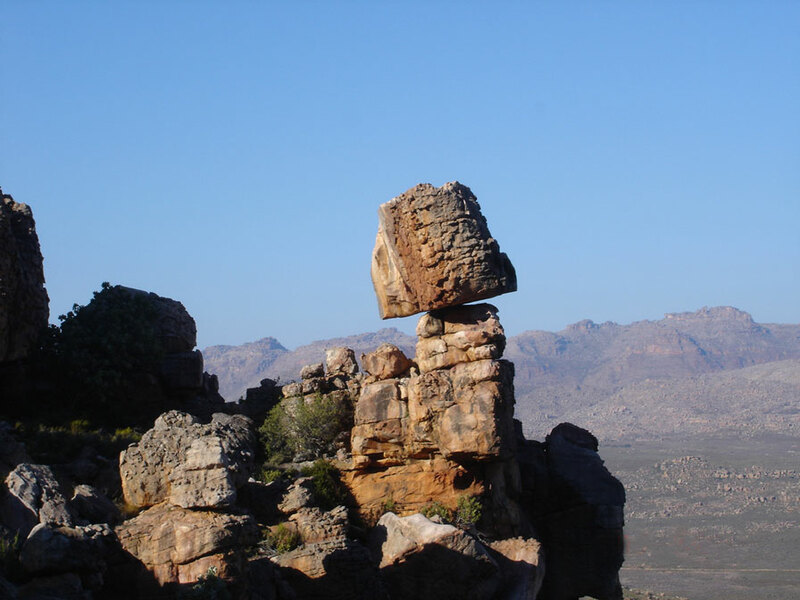 The Cederberg 100 Trail, which is an eight night/seven day trail of about 100km, was inaugurated in August 2012 by two teams of six hikers. 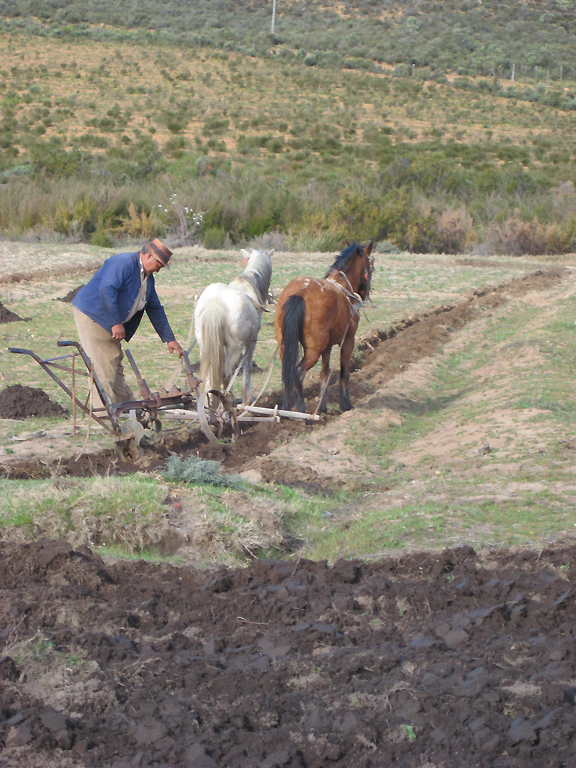 One group walked from north to south, starting at the Pakhuis Pass and ending at the Driehoek Tourist Farm. The other group did the trail in reverse. Both groups experienced some very wet, cold weather, but they were not deterred from completing the hike, albeit with some changes in routing to avoid swollen rivers. 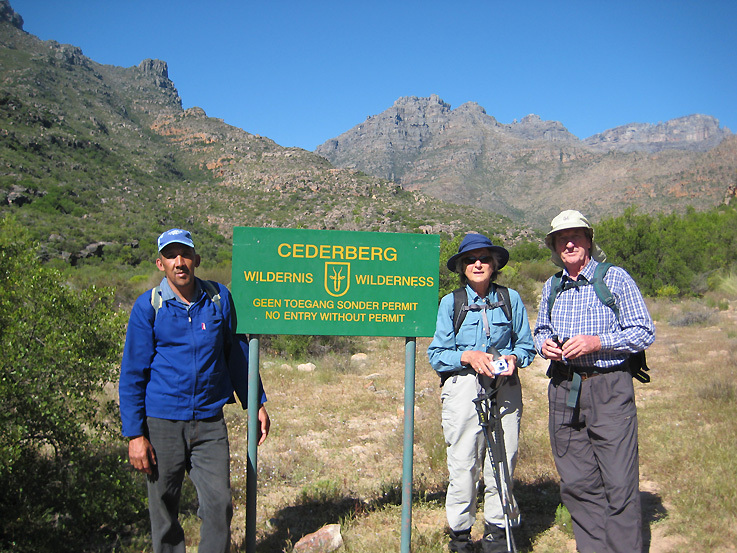 The participants agreed that the Cederberg 100 was a very interesting and manageable trail and should be included in our portfolio of trails. It will be offered only in the north to south direction. 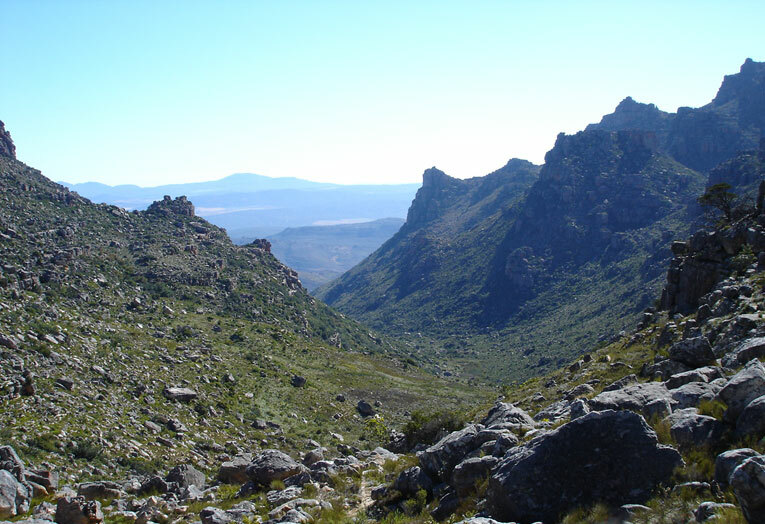 The large fires in the northern Cederberg early in 2013 caused Cape Nature to close all the hiking paths in that area until further notice. 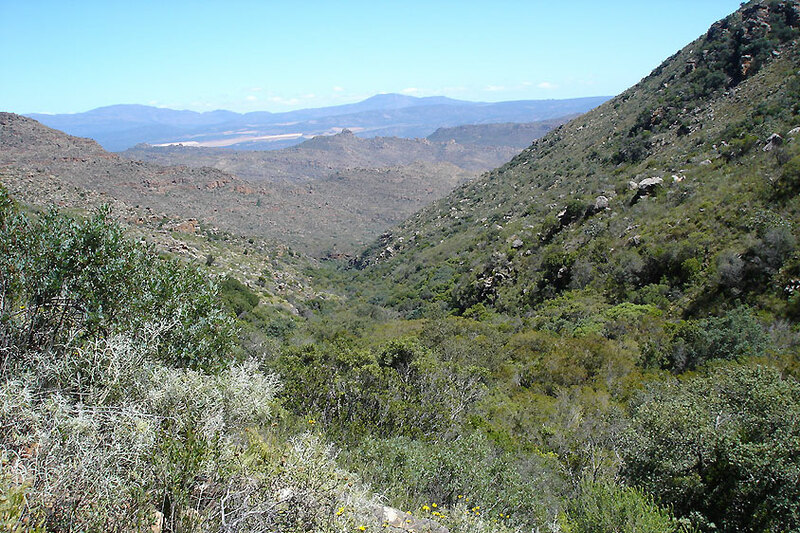 As a result, for the time being, we have had to cease operations on all of our trails except the Gabriel Trail, which operates in the central Cederberg which was not burnt. However, the Wupperthal Trail is now available again, using a somewhat different routing for Day 2 in order to avoid the burnt areas. 2. 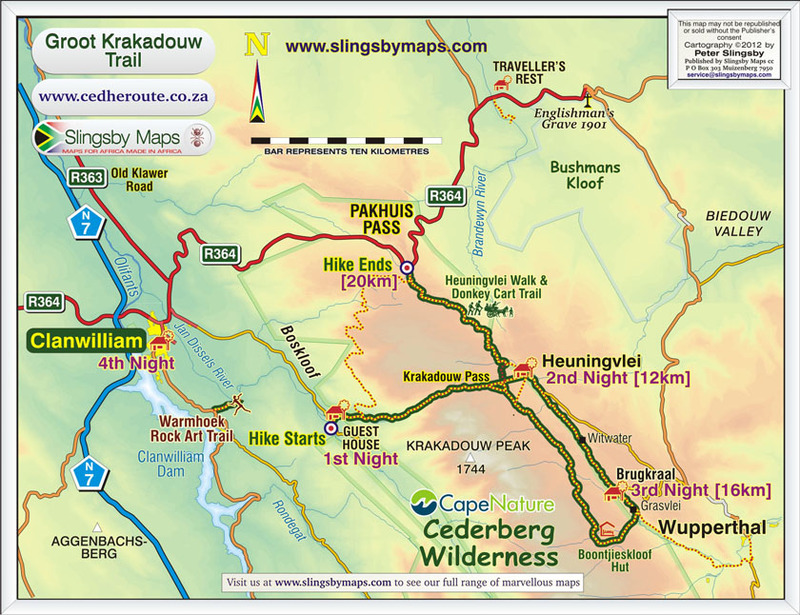 The results for the year ending 28 February 2013 showed a considerable improvement on the previous year, but our trails are still very under utilised as can be seen from the numbers below. 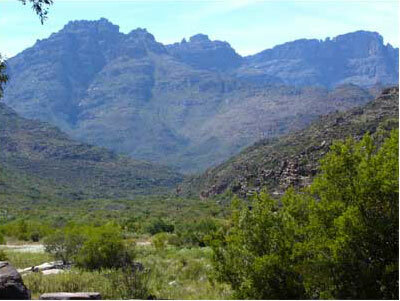 We are busy with a campaign to advertise our trails to as many hiking clubs in South Africa as we can reach. We have not yet made any significant impression on the potential overseas market and welcome any suggestions. Only 104 persons walked our trails, we sold 389 bed-nights and the income to our Service Providers was R249 914. 3. The comparative results for the last five years were 08/09, 268 bed-nights and R118 807, 09/10, 319 bed-nights and R171 911, 10/11, 378 bed-nights and R227 336, 11/12, 225 bed-nights and R157 849, 12/13, 389 bed-nights and R249 914, making a total of 1579 bed-nights and R925 817. 4. Cedarberg African Travel has continued to provide a central reservation office for our Trails and to co-ordinate the activities of the many local Service Providers. I thank them for their efficient and enthusiastic support. We couldn’t operate without them. 5. A second weekend guide training camp was run for us by the Cape Leopard Trust and held on 1 to 3 February 2013 at Matjiesrivier. It went off very well. Feedback from attendees was very positive. We hope that this will become an annual event. 6. 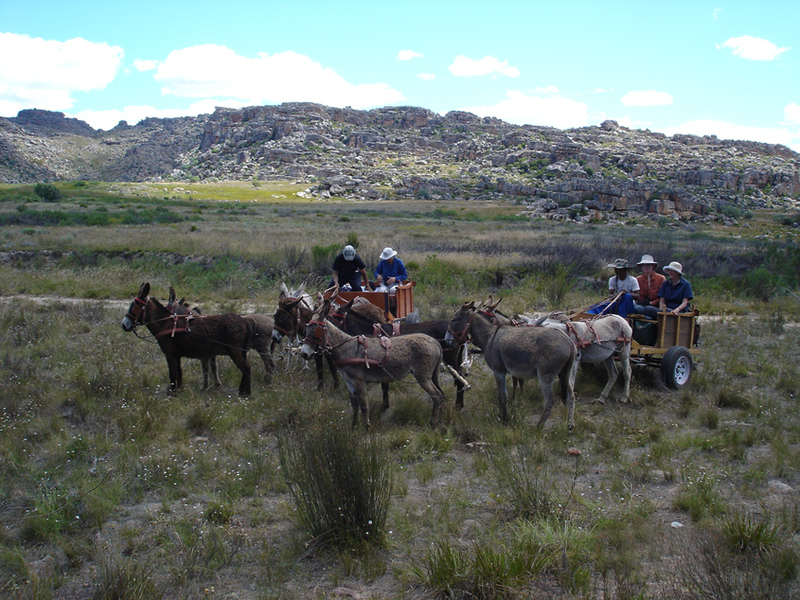 Our website, www.cedheroute.co.za, contains full information on all our trails as well as a page that advertises the Donkey Cart Trails, the guest house accommodation available in the various Moravian villages, contact details for each village and hiking highlights in each area. 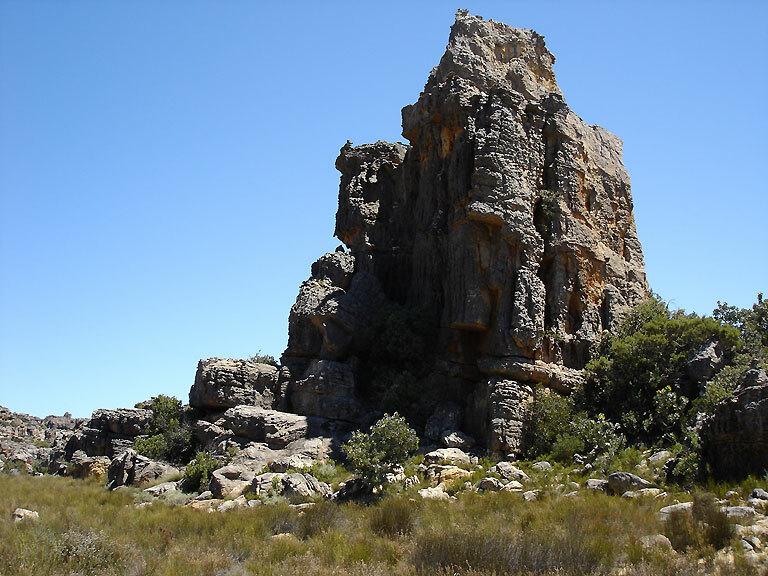 During the year there were articles about the Cederberg Heritage Route in Getaway magazine and Go magazine and in the July 2013 issue of Country Life there is an extensive article about the Cederberg 100 Trail. 7. 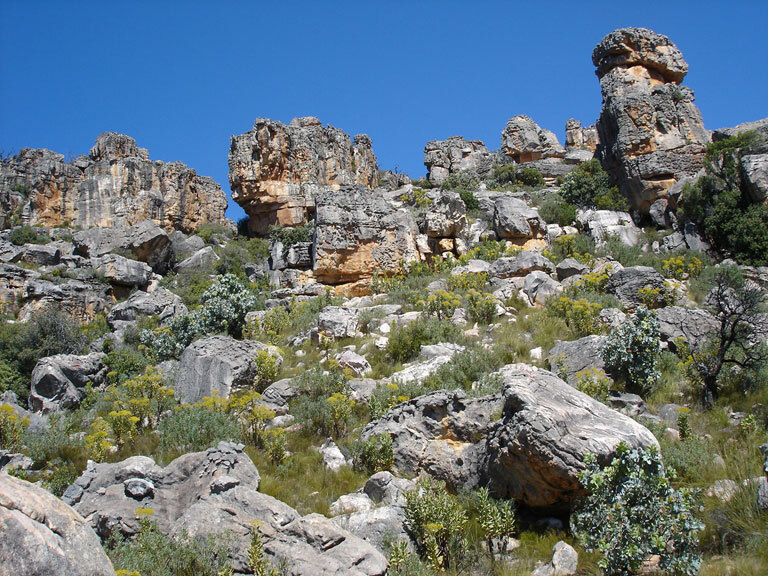 There has been a concern that Cape Nature permits for day hikes in the Cederberg Wilderness are not available in the Moravian Church area of the eastern Cederberg nor, over weekends, in Clanwilliam in the west. Cape Nature have now agreed to allow Heuningvlei Tourism to issue permits, under the necessary conditions. 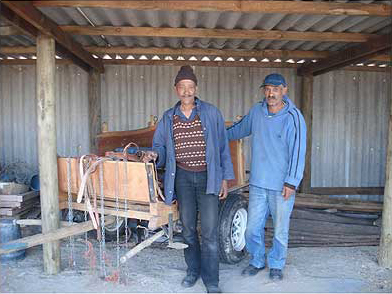 They will also try to find a way of making permits available in Clanwilliam at weekends. 8. The Management Committee has met three times since the last AGM. 9. I would like to thank the Moravian Church for providing the venue for our meetings, the committee members for all their efforts and the Service Providers for their enthusiastic support. 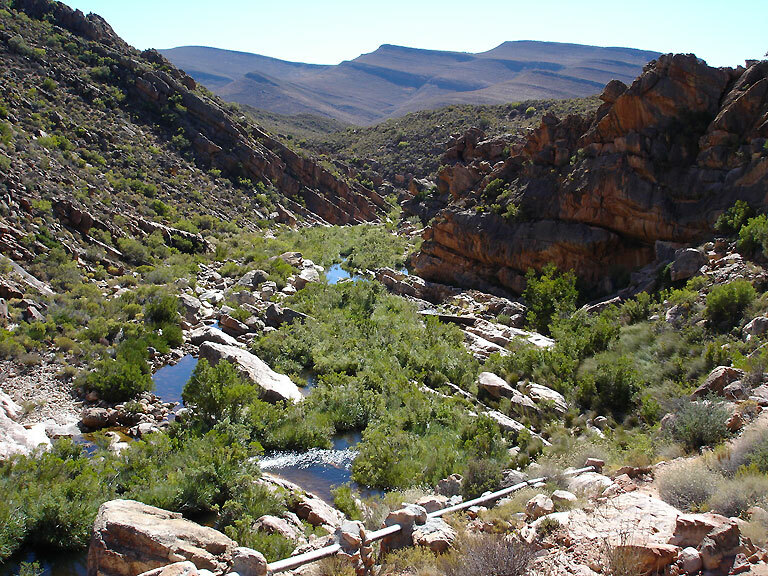 Day Walk permits for the Cederberg Wilderness area are now available, seven days per week, from the Cape Nature office at their Kliphuis Campsite on the Pakhuis Pass, that has been re-opened recently. 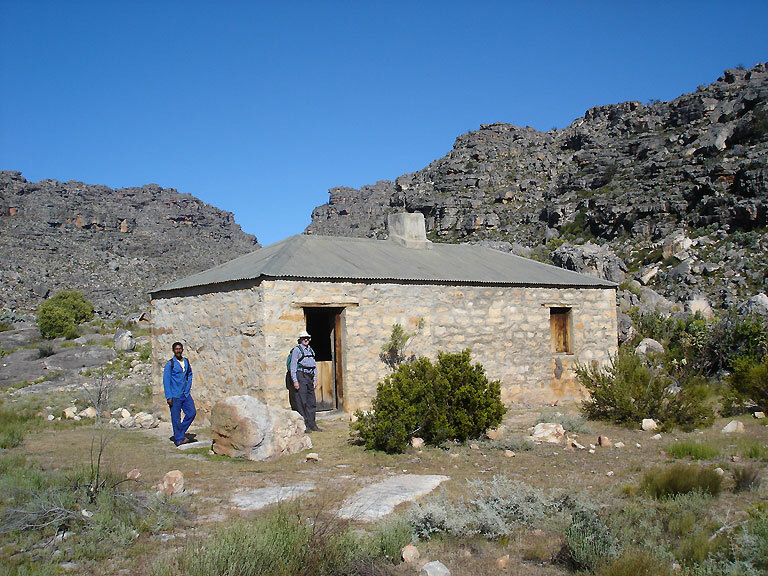 This is a convenient place to get your permit (or permits) if you are planning to hike into the Cederberg Wilderness from the Moravian villages on the eastern side of the mountains. For further information see the “Other Activities” page in this website. Wupperthal Trail has been re-opened. As from 1st July 2013 the Wupperthal Trail will be open for business again. 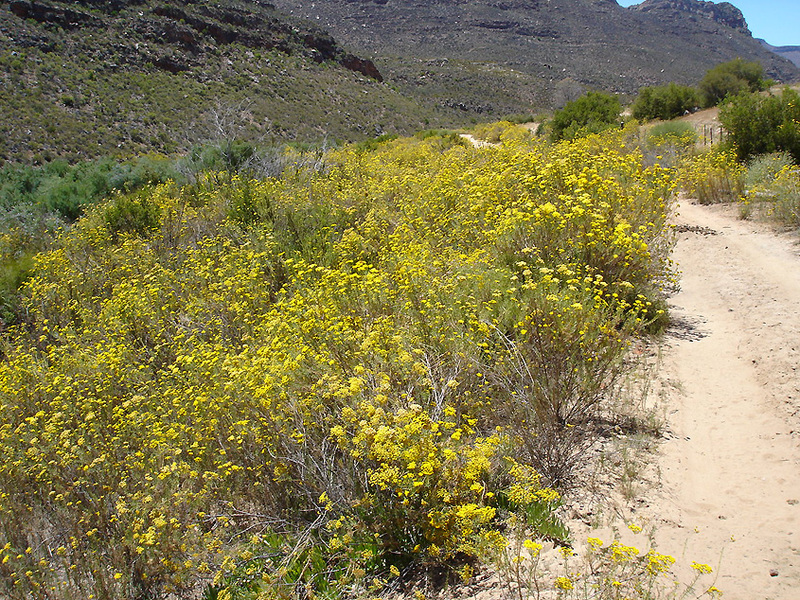 This trail, along with three other Cederberg Heritage Route trails, had to be closed temporarily as a result of the extensive veld fires in the northern Cederberg area early in 2013. 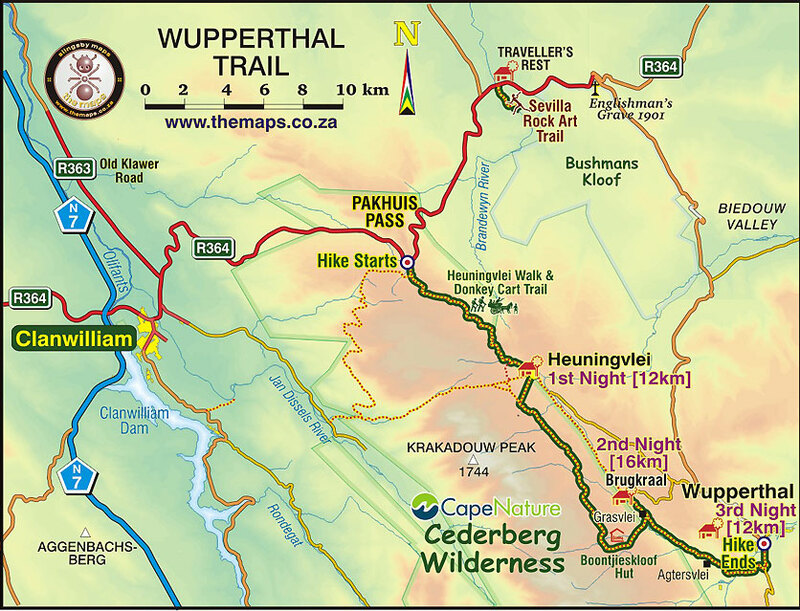 In order to re-open the Wupperthal Trail we have made a temporary change to the route for Day 2 of the hike. 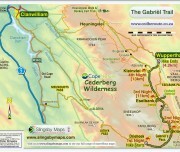 Please see the Wupperthal Trail page in the Hiking Trails section of this website for details. We believe that this temporary change will not detract from one’s enjoyment of the trail. Posted in Blog	| Comments Off on Wupperthal Trail has been re-opened.